NOTICE:Email us if you have any quality problem of our RGB Flood Light,Free replacement within 30 days. RGB flood light can be used courtyard and landscape tree, also for bar, stage, entertainment places, coffee shop, home, party, banquet, festival decoration etc. It also can decorate and rich the night view, beautify and improve the city image. 1. The security Light can be used on garden, yard matching with ground stake. It can realize 360° rotation without any tools, and change the light by up/down, it's easy to adjust the beam angle and distance. 2. The security Light is equipped with remote control and has a built-in CR2025 button battery. Aiming the infrared receiver, receive signal distance is 5-8 meters. 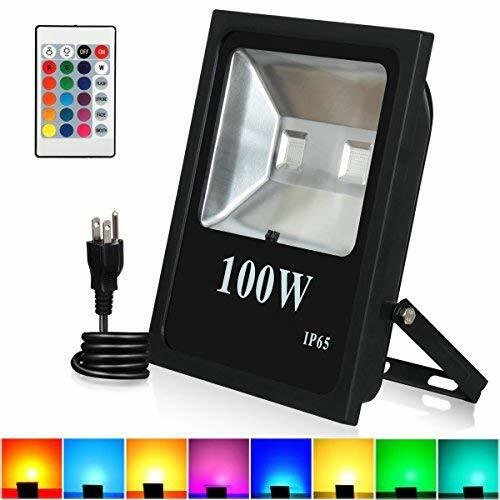 Functions of the light are as below: turn on/off the power, brightness control, RGB color change, static speed regulation, static color selection and power-off Memory. 4 main colors Red, Green, Blue, and White. Total 16 color tones, Wide beam angle 120°. FLEXIBLE INSTALLATION: With 160°adjustable lamp body and metal bracket, flexible to meet your lighting requirements. It can be mounted at ceiling, wall, ground, etc. Beautify the landscape: Multicolored light show the exuberant view for the night, beautify the city and improve the appearance.